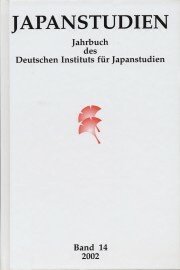 Volume 14 of the DIJ yearbook Japanstudien [Japanese Studies], published in December 2002, focuses on the topic “Japan in a Paradigmatic Perspective.” Japan seems to be of special interest for studies in the humanities, social sciences and economics; it has been one of the most frequently used countries for comparative studies over the past decades. In the past, when it was time to create and formulate general notions, theses and theories in the above-mentioned disciplines, the point of reference taken was the so-called “Western” example. In that sense, the underlying question in this DIJ yearbook is whether and to what degree Japanese studies, i.e., research on Japan, can contribute to the development of the humanities and social sciences and the general formation or modification of models and theories. In addition to ten essays contributing to the main focus of this volume from the perspective of sociology, anthropology, history, political science, law, economics, cultural studies and gender studies, linguistics and literature studies there is one miscellaneous article as well as ten reviews of recent books published in English, French, German and Japanese.